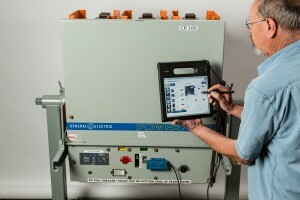 The CBAnalyzertm test system uses a personal computer or tablet pc in conjunction with our CBAnalyzer Windows software program, internet data transfer, and sophisticated, condition-based analysis to rapidly and efficiently determine circuit breaker condition using vibration analysis. Analysis of the vibration signature taken with the CBAnalyzer provides a comprehensive view of the condition of the entire circuit breaker. It can even be used to calculate contact parting (or closing) time by observing the distance between the first two major vibration peaks. Potential problems that are diagnosed using the CBAnalyzer circuit breaker test system will allow maintenance personnel to focus on the breakers that need the most attention. One of the complicating factors of maintenance efforts is the need to have a shutdown before any maintenance can be performed. The CBAnalyzer circuit breaker test system allows a quick check of your circuit breakers during routine switching operations. Furthermore, since performing a test simply involves magnetically attaching the accelerator to the circuit breaker and operating the breaker, maintenance personnel can be easily trained to perform the test quickly and safely. In the past, the first thing that was done when preparing to perform maintenance on a circuit breaker was to open the breaker and then start the maintenance, thus losing any information about the initial, first trip. 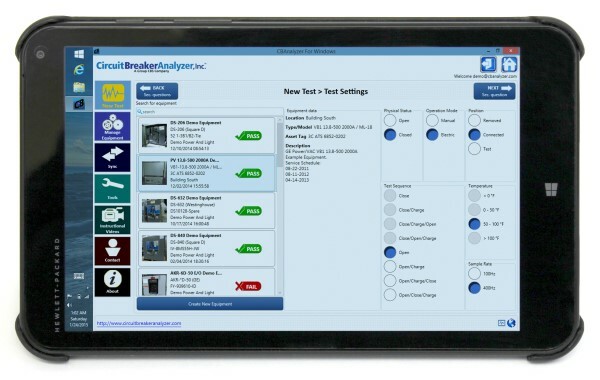 With the CBAnalyzer test system, the trip information can be captured when the breaker is first opened, thus providing invaluable information as to the efficacy of the on-going maintenance plan. The CBAnalyzer circuit breaker test system provides a comprehensive vibration analysis of the circuit breaker; consequently, potential mechanical failures can be diagnosed before they happen. Testing a circuit breaker is simplicity itself - the test set is a personal computer or tablet pc running the CBAnalyzer Windows software program and an accelerometer magnetically mounted to the front of the breaker being tested. Operate the circuit breaker. You can operate the breaker in any sequence that you wish - for example trip-charge-close. The user initiates the test and the vibration data created by the breaker operation is captured. The vibration capture will continue until a period of no vibration exceeds the built-in time limit or until the user stops the software progarm. The captured data is saved and can be analyzed on the the pc or transferred to the Account Manager's online data base for further analysis and storage. Requires no modification or removal of circuit breaker - test it in its cubicle. Use the following links to view slideshows illutstrating typical screenshots of the CBAnalyzer test system when testing a circuit breaker, saving and syncing the test results. Slideshow of the CBAnalyzer circuit breaker test system. Videos introducing the CBAnalyzer circuit breaker analyzer tester. Please contact us if you'd like to discuss your application, have questions answered or would like a demonstration. BTW, have you checked our circuit breaker analyzer FAQ?